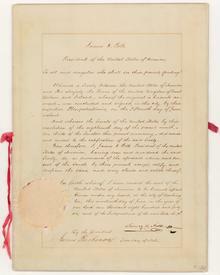 We will now see Canada moving quickly from the Act of Union (1840-1841) to Confederation (1867). Why this sudden rush? In 1845, John L. O’Sullivan (15 November 1813 – 24 March 1895), a journalist, coined the term “Manifest Destiny” in an article published in the Democratic Review. In this article, he favoured the annexation of Texas, not so much for the purpose of territorial expansion as for moral reasons. In the same article, he also promoted the annexation of the Oregon Country. Under James Monroe (28 April 1758 – 4 July 1831) and John Quincy Adams (11 July 1767 – 23 February 1848), the author of the Monroe Doctrine (2 December 1823), and perhaps emboldened by the Louisiana Purchase (1803), some Americans started to believe that they were destined, as quoted above, “to establish on earth the moral dignity and salvation of man.” In particular, Americans were to go Westward. The whole continent of North America appears to be destined by Divine Providence to be peopled by one nation, speaking one language, professing one general system of religious and political principles, and accustomed to one general tenor of social usages and customs. For the common happiness of them all, for their peace and prosperity, I believe it is indispensable that they should be associated in one federal Union. Such an ideology may have been perceived as an impediment to British expansion Westward and, eventually, to Confederation, which would unite Canada’s provinces. American-born Canadian explorer Simon Fraser (20 May 1776 – 18 August 1862 [NWC]) had travelled down the Fraser river and reached the Pacific. The British were therefore in the Oregon Country and had claims to the territory. The Hudson’s Bay Company had not been in a hurry to see this territory settled. However, there were US settlers arriving in the Oregon Country. As a result, in 1841, James Sinclair, of the Hudson’s Bay Company (HBC), took Red River Colony settlers west from Fort Garry. This was an attempt to retain Columbia District as part of British North America. He chose to guide twenty-three families to the Columbia district. The group consisted of one hundred twenty-one people. It was a brave effort on Sinclair’s part, but only Métis were able to make so difficult and lenghty a journey as could his Métis families. 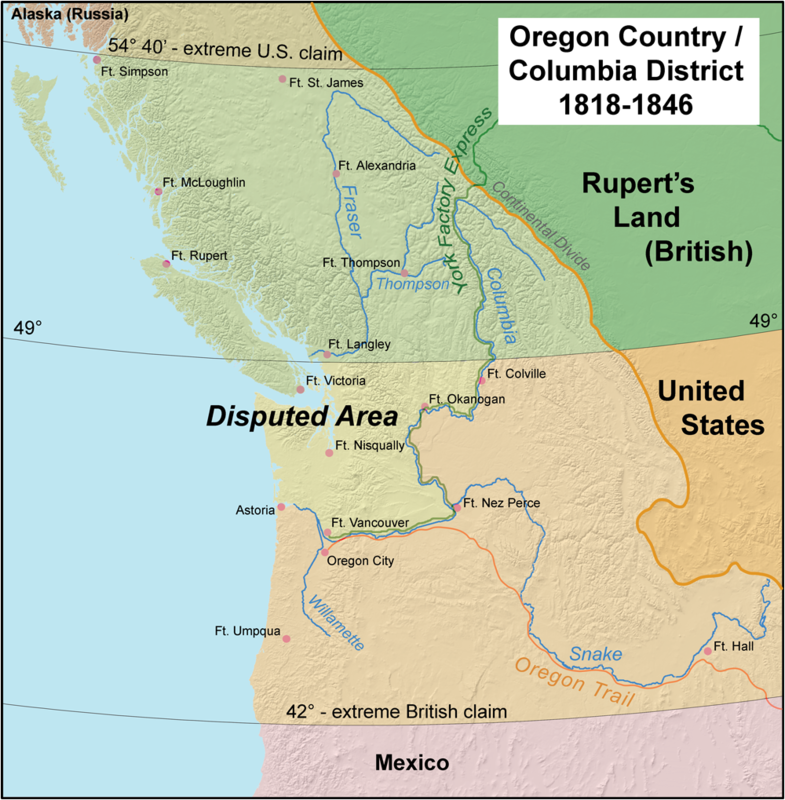 At any rate, eight years later, in 1849, under the terms of the Oregon Treaty, Britain “ceded all claims to land south of the 49th parallel” to the United States, except for Vancouver Island and little coastal islands that became the Colony of Vancouver Island. In short, one could now settle in the United Colonies of Vancouver Island and British Columbia, but how could one get there? 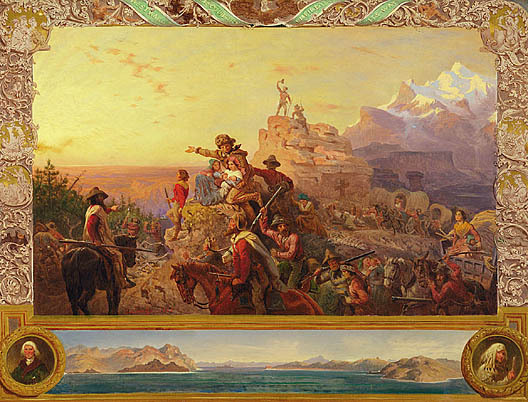 One obstacle, the Monroe Doctrine, had been circumvented, but another obstacle remained: getting across the Rocky Mountains. 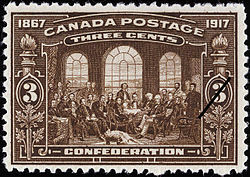 When Confederation was achieved, in 1867, the border remained unchanged and Canada now extended from sea to sea. However, travelling from sea to sea or moving to what is now British Columbia was well-nigh impossible. The Panama Canal had not been built. Building started in 1880 but was not completed until 1914. 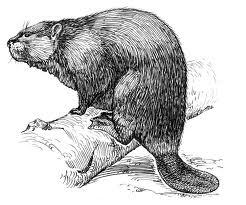 You might remember that John Jacob Astor (The American Fur Trade Company) asked Gabriel Franchère, to take voyageurs from New York City to Fort Astoria, at the mouth of the Columbia river, on the Tonquin. They travelled around Cape Horn (c. 1811). Canada would need a railway so settlers could reach the West Coast. Let me pause by stating that the Fathers of Confederation knew about the Monroe Doctrine and that they did fear active expansionism on the part of the US. In fact, I do not fully understand why the United States let the northern part of the Oregon Country go to Britain and ultimately to Canada. Obviously, there was good will on the part of both parties and I believe that eventually both parties were winners, except that the disputed land was being taken from Amerindians.